What a great achievement in the Nations Cup for Young Riders today. The Dutch team won, Italy became 2nd and Germany 3rd. No one else than Dutch champion Kim Hoogenraat en Lisa Nooren jumped clear in both rounds at 1.45m level. 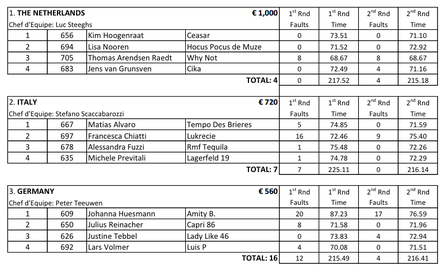 Jens van Grunsven and Cika only had one fault, while Thomas Arendsen Raedt with Why Not finished with 8/8. Italy is doing a great job. After the recent victory in the FEI Nations Cup at CSIO Rome at 1.60m level, now the young riders performed very promising. They became 2nd with amazing rounds with only one time penalty in the first round by Alessandra Fuzzi and Michele Previtali. The German team won the 3rd prize.